Swimmers had to earn qualifying times in various swimming events to earn this trip. Three of the nine swimmers qualified in individual races by swimming state regulated times. 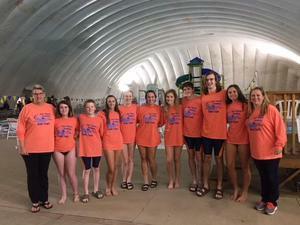 Six of Kerr Vance Academy’s nine swimmers will be participating in the finals overall in individuals and relays. With this being KVA’s first team, we never anticipated such great success in individual swims or as a team. All nine swimmers have met and surpassed expectations with their effort and dedication to the team; competing and exceeding their personal best times throughout the season. Wish them well as they head into States on February 11. It’s been a great season! Go KVA!